dRMM have gained planning approval for a mixed-use scheme on Wick Lane, which was unanimously approved by planning committee. The design, for Taylor Wimpey, successfully realises the LLDC objectives for an employment led development providing enhanced connectivity within the local area and outstanding design quality. The project successfully integrates industrial, commercial and residential uses around a high quality public realm. 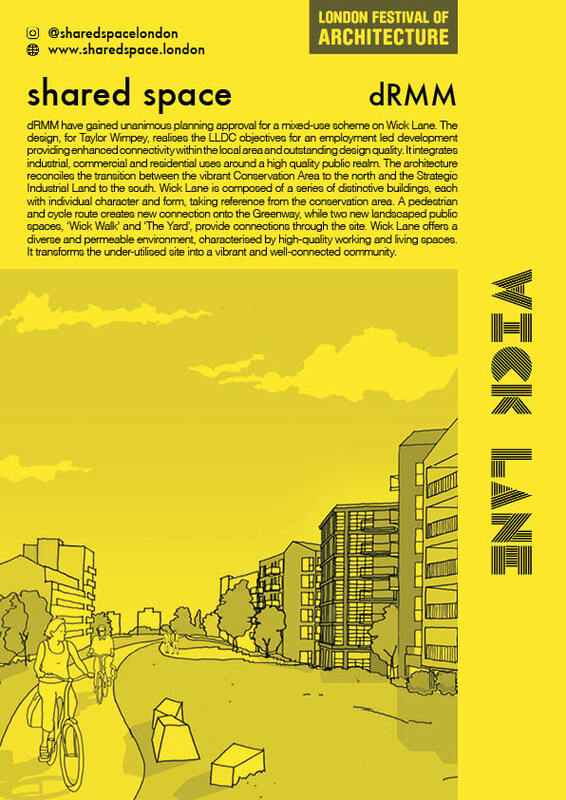 The site is located on Wick Lane adjacent to the Olympic Park, and within Fish Island, which has one of the highest concentrations of artists’ studios in Europe. To the north of the site is the Fish Island Conservation Area, a vibrant neighbourhood characterised by Victorian warehouse buildings housing a mixture of residential, industrial and creative uses. The architecture successfully reconciles the transition between the Conservation Area and the Strategic Industrial Land (SIL) to the south. A key component of the scheme is the creation of a new pedestrian and cycle connection onto the Greenway. The scheme is composed of a series of distinctive buildings, each with an individual character and form, taking reference from the conservation area. The individual elements skilfully achieve a coherent composition, which further enhances the vibrant character of the area. The Wick Lane frontage offers a variety of of employment spaces; a combination of stand-alone double height industrial units and up to three levels of commercial space providing an activated frontage. Residential accommodation is strategically set back from Wick Lane, maximising daylight, views to the Greenway, and providing a high proportion of dual aspect units. The landscape design, by Grant Associates, creates two new high quality public spaces, ‘Wick Walk’ and ‘The Yard’, which provide connections through the site. The scheme also offers two gardens at podium level, providing amenity and play space for residents and facilitating an improved outlook for the neighbouring building at 417 Wick Lane. The proposals at 415 Wick Lane offer a diverse and permeable environment, characterised by high-quality working and living spaces. They transform an under-utilised site into a vibrant and well-connected community.